It’s hard to underestimate how important ranking in Apple’s top 25 in the iTunes store is for mobile app developers. After all, the top 25 is probably the single most important app discovery mechanism for most iOS users. But how many downloads does it take to rank in the top 25? Mobile app store analytics firm Distimo today published some interesting data that answers just this question. Turns out, in the U.S. store, the answer currently is about 38,400 daily downloads for free iPhone apps and 3,530 for paid iPhone apps. To rank in the top 25 per category, of course, takes significantly fewer downloads, with games unsurprisingly being the most competitive category. 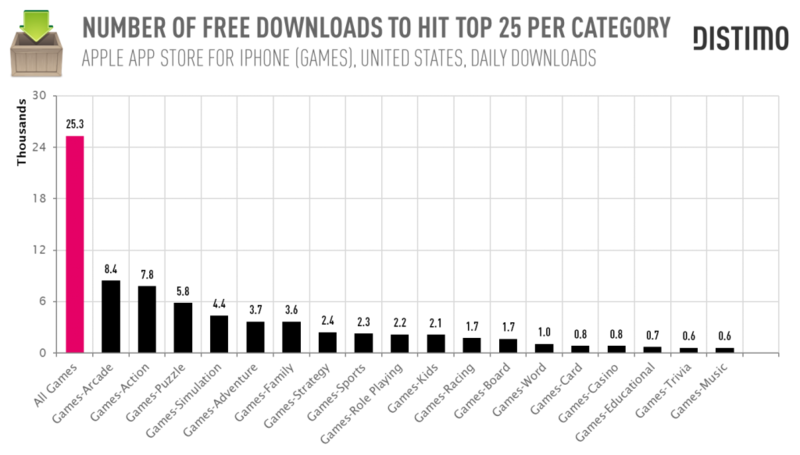 It takes 25,300 daily downloads to rank in the gaming top 25 for free apps and 2,280 downloads for paid apps. For free apps, other competitive categories include ‘entertainment’ (6,700 daily downloads), ‘social networking’ (5,800), ‘lifestyle’ (3,900) and ‘music’ (3,900). Interestingly, in the paid app charts photography apps rank just behind games and entertainment apps. Still, it currently only takes about 270 daily downloads to rank in the photography top 25 for paid apps. These numbers, of course, are always changing and this just represent a snapshot of what Distimo found when it compiled this data last month. Update: We just talked to one source with a lot of experience in building mobile apps and who also currently runs a top App Store app. According to this source, Distimo’s numbers are too low and may just represent data from a relatively small number of apps. Keep that in mind as you read Distimo’s data. This is the first time Distimo is releasing a detailed set of these numbers. 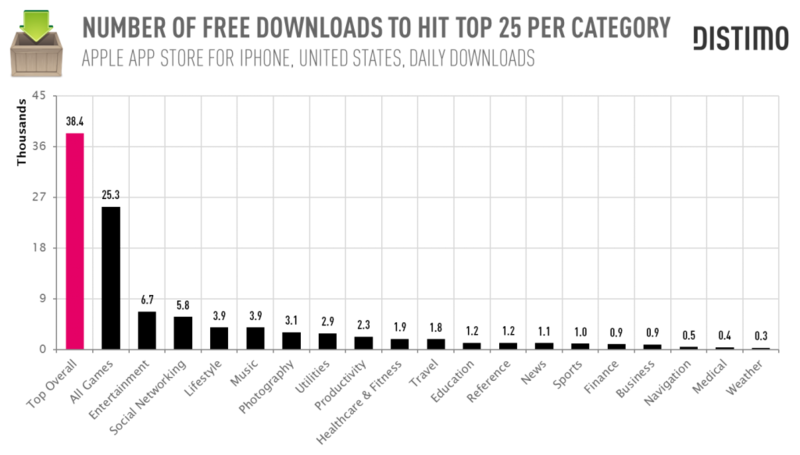 It’s worth noting, though, that at the end of 2011, the company reported that it still took about 45,000 daily downloads to rank in the top 25 of most popular free apps. Since then, though, Apple has been working hard to shut down various scams and bots that automatically downloaded apps and allowed developers to rank in Apple’s charts without having a real user base (then, once you are in the top 25, of course, real users will automatically find you, of course). Judging from Distimo’s latest data, these efforts are starting to pay off and will hopefully make life a little bit easier for legit developers.